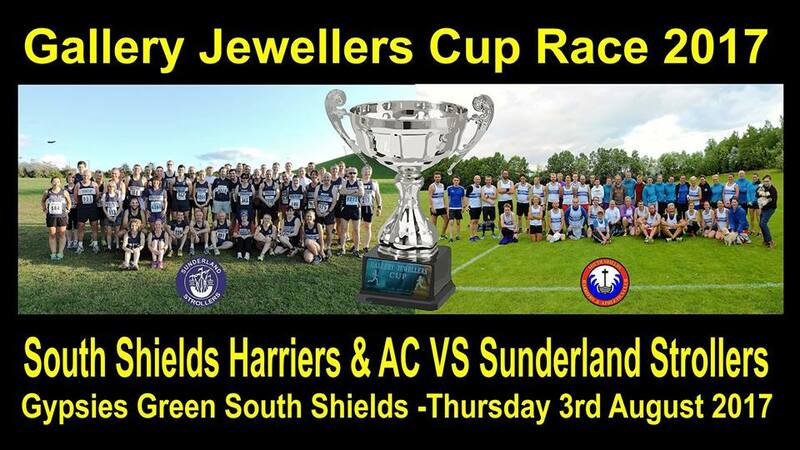 The Gallery Jewellers Cup Race is an Annual Inter Club Race between South Shields Harriers & AC and Sunderland Strollers and this year the course is on the Leas & along the promenade finishing at Gypsies Green in South Shields. There is a wide range of ages taking part so the race is age handicapped. Gypsies Green Stadium from 6pm. ASSEMBLY area: The assembly area is at Mangos/ Waters Edge beside Trow Rocks. All participants should be at this point no later than 6.45pm and the race will start at 7.00pm. Can runners make sure that they are ready to run in their relevant age groups please as you will be called to the line before each group sets off. The start of the race is beside the gate at the end of the promenade which then goes up the path in the middle of the Quarry, turn left at the top and follow the path towards the cliffs then left again and down the steep bank which leads past the start and along the prom past Gypsies Green and behind the fairground till you get to the pier. Run left around the back of the boathouse then turn right and run along the pier towards the sea and right again down onto the beach path ( Donkey Path ) which leads eventually back onto the promenade next to the Sundial pub. Continue along the prom again till you get back to the start. You now run back up through the middle of the Quarry path again but at the crossroads this time run straight ahead and across the Leas until just after the bus stop on the coast road footpath. Turn right onto the footpath and run past the Bamburgh Pub and down the bank into Gypsies Stadium where you run clockwise around the track to the Finish. Total distance is approx 4.26miles just short of 7k.